For projects where hardwood, tile, carpeting, or other flooring options just won't do, let a few simple coats of paint come to the rescue. 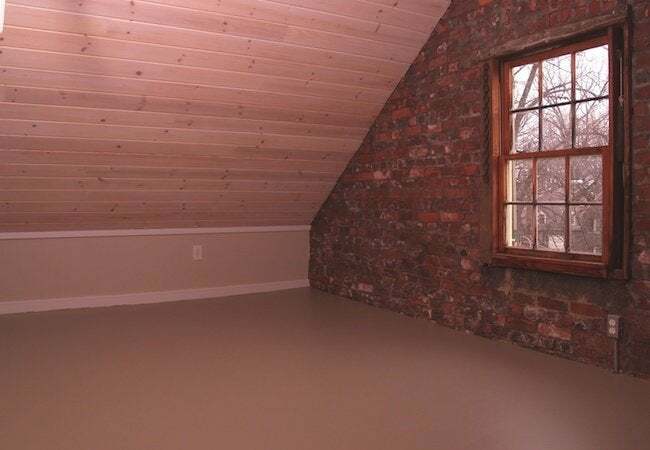 For our newly renovated attic, we’d wanted solid wood flooring, but that idea, it turned out, wasn’t practical: The attic floor is out of level—so much so that it’s actually wavy. Back to the drawing board we went. Laminates were out of the running, because we feared ending up with the spongy feel common to many floating floors. Other materials merited consideration, but wall-to-wall carpeting seemed like the answer. It wasn’t long into our search before we realized that nice carpet costs a lot. In perusing hundreds of samples, we compared weights, studied density, thought about textures, scrutinized colors, examined backings, puzzled over padding, and became really confused by the sheer variety of fiber types out there. Plus, we found it nearly impossible to compare sellers accurately, because different companies have different pricing schemes. Finally, we opted for a “green” carpet, a product derived largely from recycled plastic bottles. 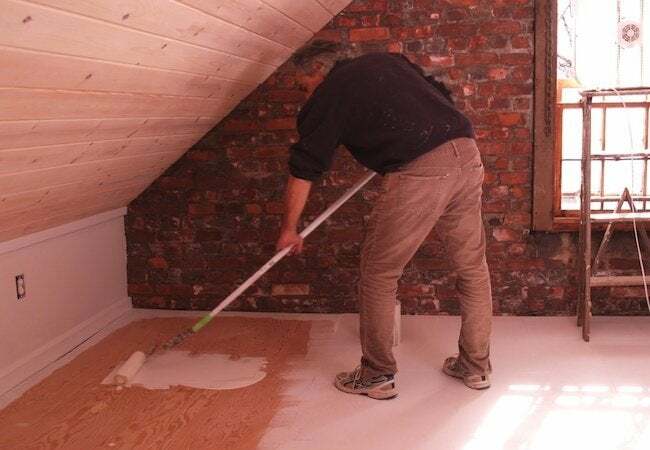 The attic conversion had proved such a long and challenging process that we were comforted by the knowledge that installing the carpet would be quick and painless. But then we got the estimate: $2,000! That’s when we ditched the idea of wall-to-wall carpeting and headed over to the paint department of the home center. We decided to prime and paint the plywood floor, strategically placing area rugs to cozy things up. The total cost? About $250—50¢ per square foot—and that includes paintbrushes and rollers, wood putty, and other small items. Note that our project started out with good-quality plywood, but if yours is in bad shape, add a new layer of 3/8-inch A-C plywood. For a space likely to witness a lot of wear, choose hardwood plywood. First, make sure the plywood flooring is firmly attached to the joists below. Then fill all the nail holes and joints in the surface with patching compound. At this point, it’s smart to ensure that the space in which you are working has adequate ventilation (in other words, set up a fan in the window). Sand the plywood to whatever smoothness you want. 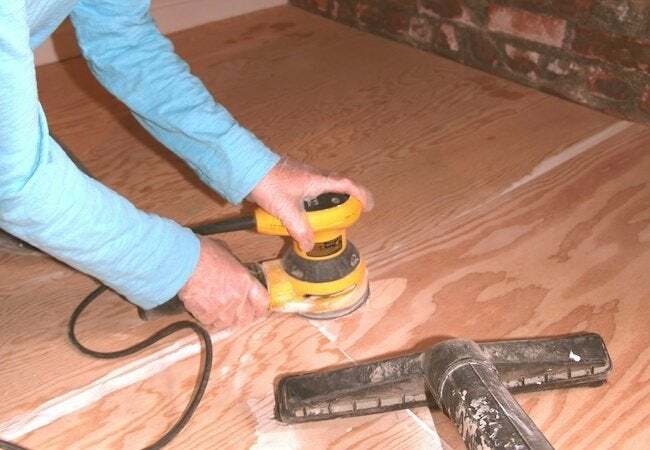 For a larger area, we might have gone through the trouble of renting a floor sander, but here it took about as much time and was cheaper to use a random-orbit sander, fitted with 120-grit disks. Complement the palm sander with a wet/dry vac in order to minimize dust. For a low-mess job, run the vacuum intermittently as you finish sanding sections of the floor surface. 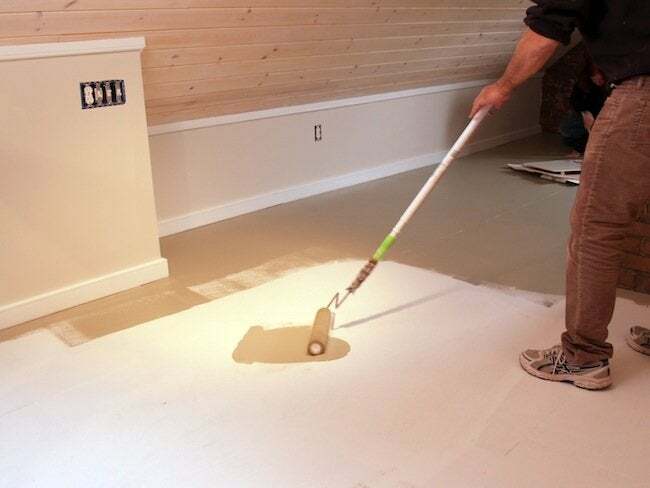 With a paint roller attached to an extension pole, apply two coats of primer to the plywood floor. Everyone has his own favorite primer; mine is pigmented shellac, because it dries quickly and provides a good base for the top coat. Depending on the size or layout of the room in which you are working, it may be more convenient—or in some cases, strictly necessary—to prime the floor one section at a time. We coated our plywood floor in enamel paint, which comes only in a satin finish. If you want a semi-gloss or glossy look, you can use that type of paint, but you must protect it with a layer of water-based polyurethane. When it comes to applying your coats, a 12-inch roller speeds the job, while a 3-inch brush is good for cutting in at corners. If you pause during the process, wrap your painting tools in plastic to save on cleaning time. 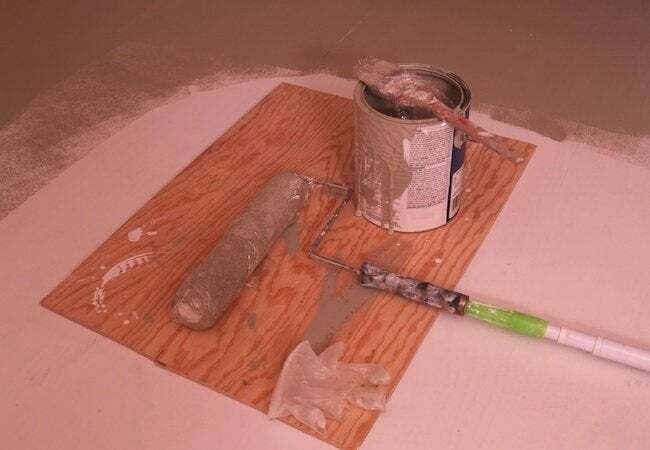 Apply the paint as evenly as possible, as if you were doing a wall, allowing each coat to dry completely before continuing. Finish off sections with smoothing strokes, rolled in the same direction, before the paint dries (the roller should be moist but not loaded with paint). Allow the paint to cure for several days before moving in furniture, but in most climates you can walk on your new floor, in socks, within a few hours.